What a charming read! I wasn't so sure, going in, how well I would like this. There are few high fantasy novels that I truly love. While there are no elves, orcs, dragons, vampires, shifters or a dormouse to be found, this was just as great as other high fantasy novels. What is scarier to read? About an army of orcs who will destroy everything in sight or the evilness of men? I found what a human would do to gain what they desire at any cost just as frightening. More so, since we've all seen the evilness of man and what one is capable of. 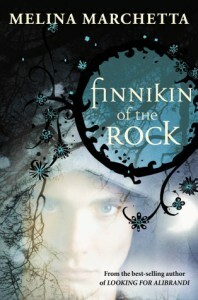 Finnikin was a great character. I loved him from the start. He was humble, sometimes cocky, brave and had a love for his people so great he was willing to do anything to save them. But what I loved about him was his charm. He was genuine. He cares more than he wanted to, the hurt and pain of his people affecting him. He's just barely a man, still needing to grow into his new body, but as I read I could already see the man he would become. He would be a great man, just as great as the father he admired and respected. The story was great. The pace was excellent, the writing great and the characters were lively. I don't know if I am the only one, but a good amount of books I read tend to have "filler" scenes. Useless to the story, but there to make the book long enough. I tend to skim these scenes with a heavy sigh. Marchetta doesn't pollute her story with filler scenes. The story is full of adventure and mystery. I don't know why I waited so long to read this one. I wish I had read it sooner, but I'm glad I have finally read it. This was a joy to read.